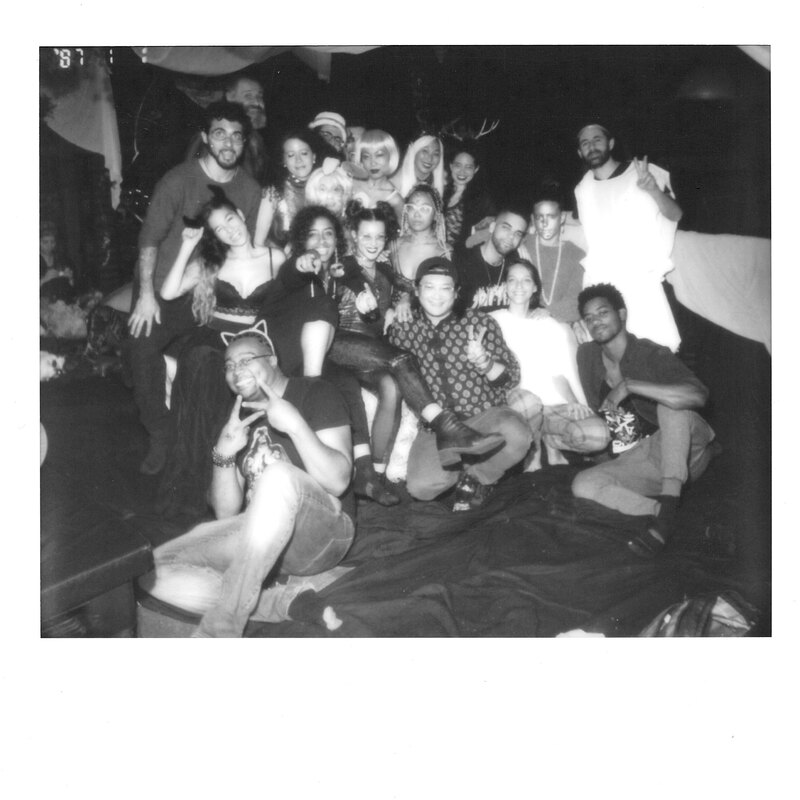 The partiers at BAE’s Mystic’s Playground party with co-host Reem Abdou (bottom, center), 134 Metropolitan Ave, 10/27/18 at 2am. 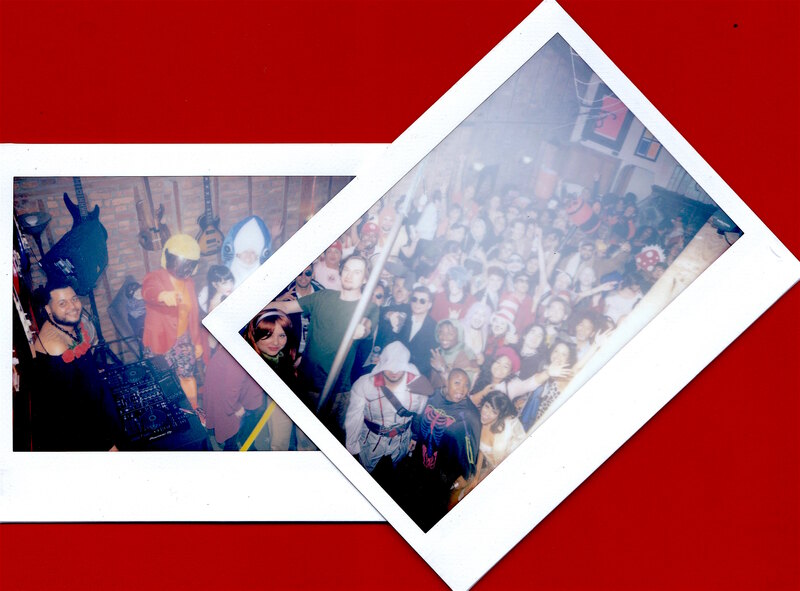 While you may be under the illusion that Halloween starts tonight, the city’s hardest partiers have been filling clubs, bars, and warehouses since the weekend. 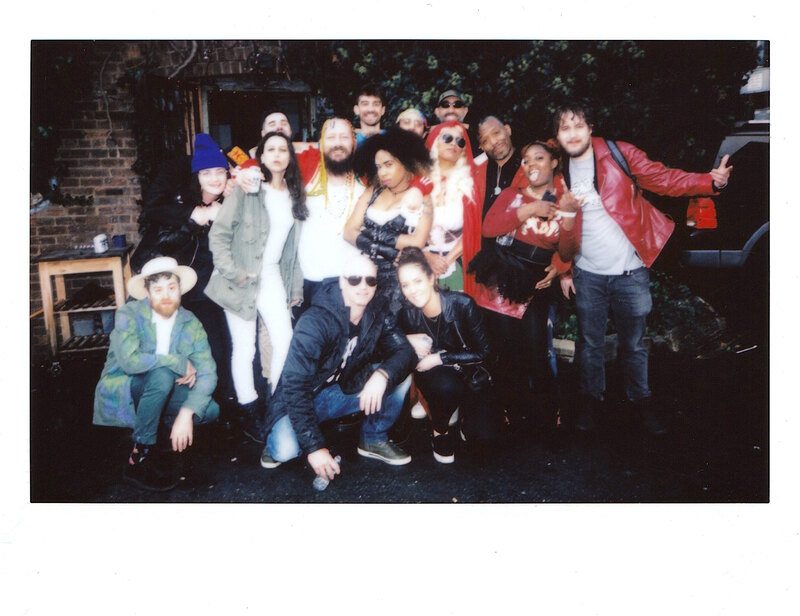 On Saturday, I hopped from the Upper East Side to Brooklyn, visiting underground and above-ground venues like House of Yes, Secret Mansion, and Strangelove Bar, as well as dance parties like BAE’s Mystic’s Playground and the annual Bang On! rave, Warehouse of Horrors. I even stopped by Videology to photograph the bar/screening room before it ghosted. My very late night continued well into Sunday as I captured a plethora of special-edition hangover brunches. Over at Roberta’s, DJs Alanna Raben and Big Vic held their latest edition of Grunch, an unashamedly ’90s fest with food specials titled after the era’s hit songs. When Raben played Blink 182’s “What’s My Age Again?” in the dirty nurse outfit form the album’s cover, literally everyone sang along. Still hungry, I headed to The Keep in Ridgewood, where G House NYC‘s Dead Man’s Brunch went till 9pm. DJ Mike Trotter spun for guests needing “hairs of the dog” whilst enjoying shows from performers Lady Havokk and Hannah Lou, whose rendition of Rocky Horror’s “Sweet Transvestite” was perfect for our unofficial holiday. 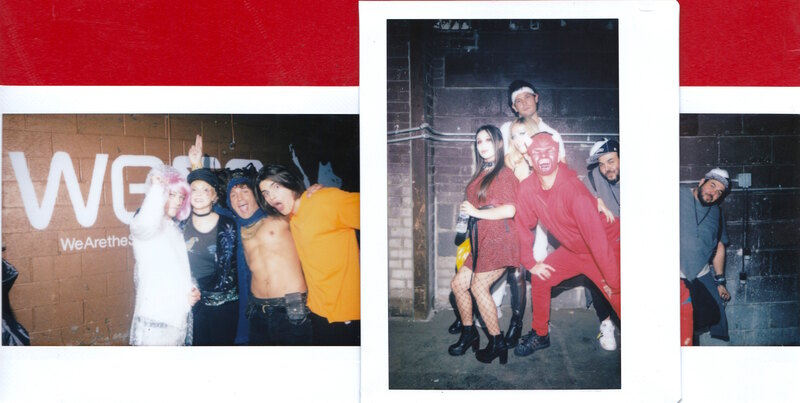 After 48 hours of documenting folks who might only dress up once a year, it was a joy to see performers that do it almost nightly so that we can experience a little bit of Halloween each and every day. 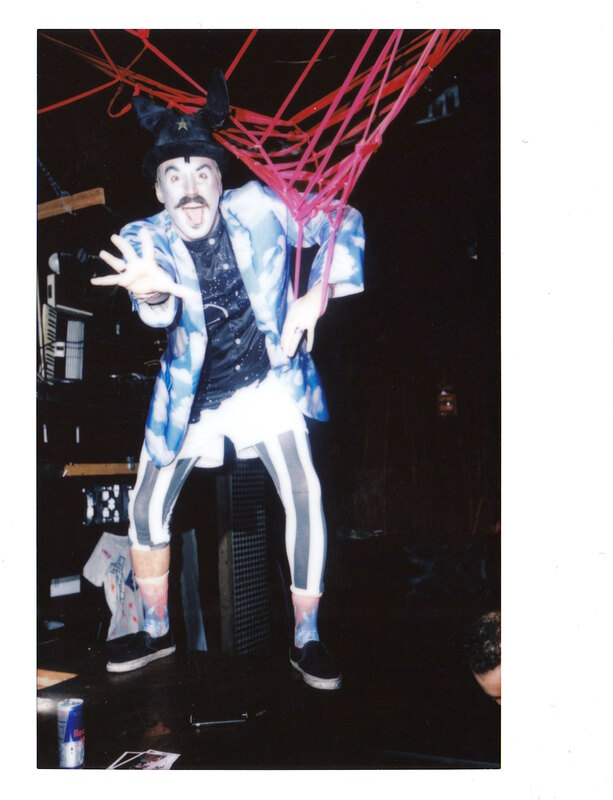 House Yes “fun tender” Rawb Lane pulling at the venue’s giant webbing during its House of Hallucinations Halloween party, 10/28/18 at 4am. 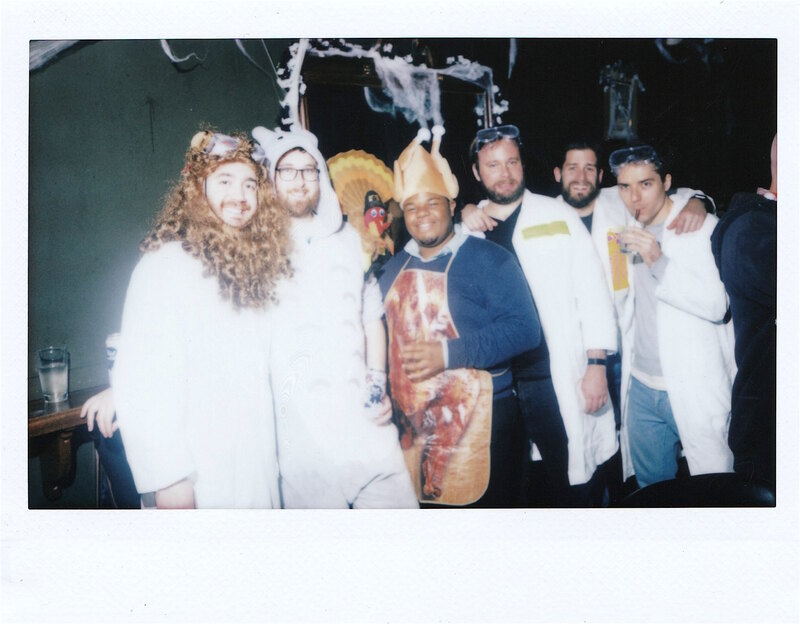 Partiers dressed at butchers with a turkey at Bootleg Bar, 10/26/18 at 11pm. 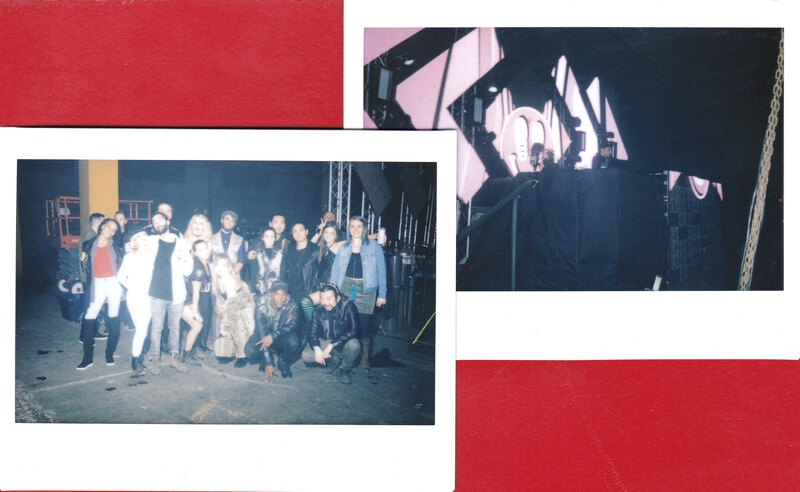 DJ Hiawatha (left photo, bottom right) with friends behind the the Earth Stage as G Jones (right photo, center) spun his set for Bang On!’s Warehouse of Horrors, 10/27/18 at 12am. Bang On! co-founder Tim Monkiewicz (left photo, second right) with his fellow My Golden Pony DJ Thomas Murphy (right photo, top, behind the Fire Stage before their set for Bang On!’s Warehouse of Horrors, 10/27/18 at 12:30am. Mystic’s Playground artists (left photo, l to r) DJ Shakey, Illexandra, Jackson Lin, Reem Abdou and Matt Sebastian during the performance of DJ’s Beat Kitty and Mr. Jennings (right photo, l & r), 10/27/18 at 2:30am. Upstairs lounge at Mystic’s Playground. 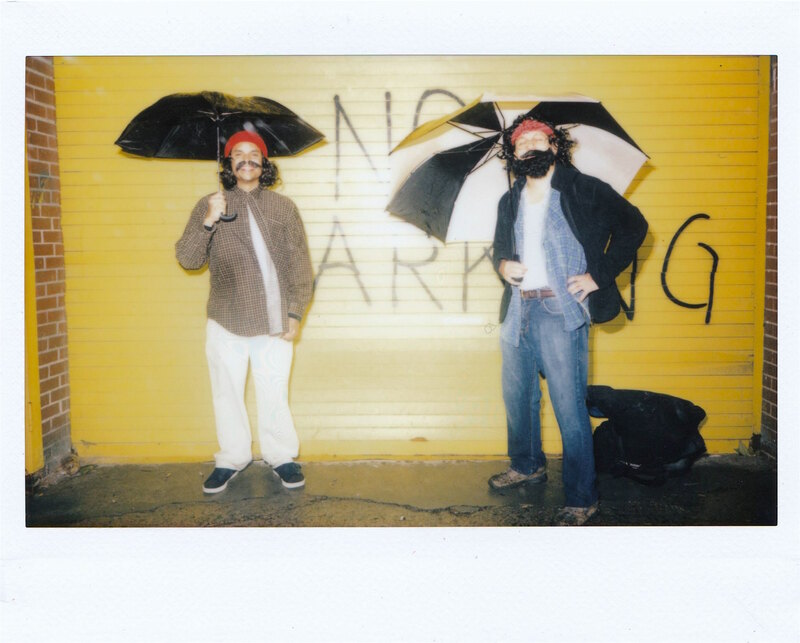 Partiers dressed as Cheech and Chong smoking in the rain outside Mystic’s Playground. DJ Big Vic (middle, far right) closing out Coco 66 with host Jodi (top, left), 10/27/18 at 3:30am. 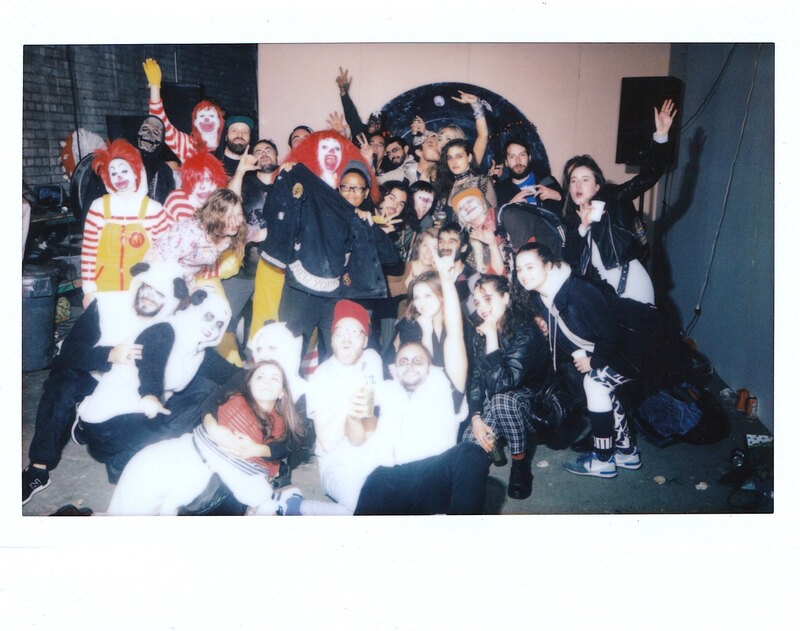 Black Label co-president Conrad Carlson (right photo, in truck) with his partiers for Bike Kill XV at Plax-all Studios in Long Island City, 10/27/18 at 5pm. 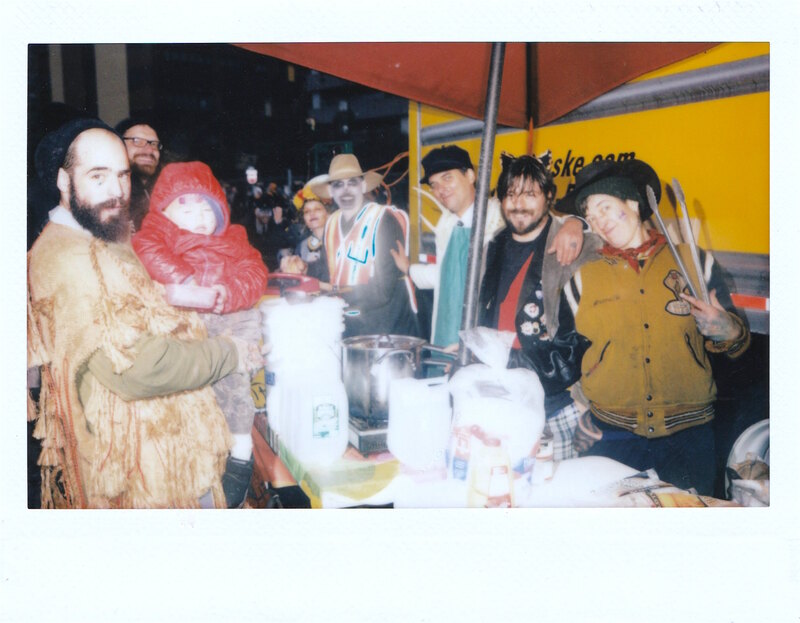 Battle of Mau Mau founder Orien McNeill (second from left) with the Bike Kill 15’s food stand. Artists Christen Clifford and Amy Finkbeiner with their “Flower Kart : Matriliny Access Station” installation for Art in Odd Places’ exhibition at Westbeth Artists Center in the West Village, 10/27/18 at 6pm. 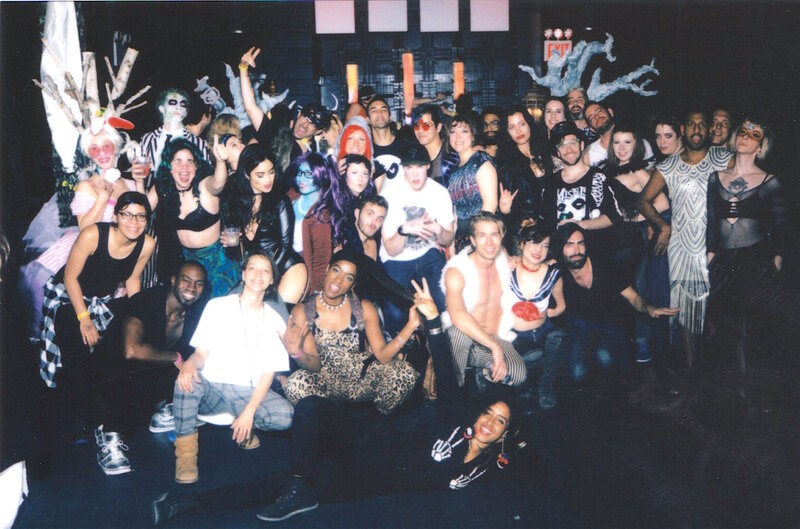 Bartender Brian serving Halloween party pre-gamers at Strangelove Bar in the Upper East Side, 10/27/18 at 7pm. 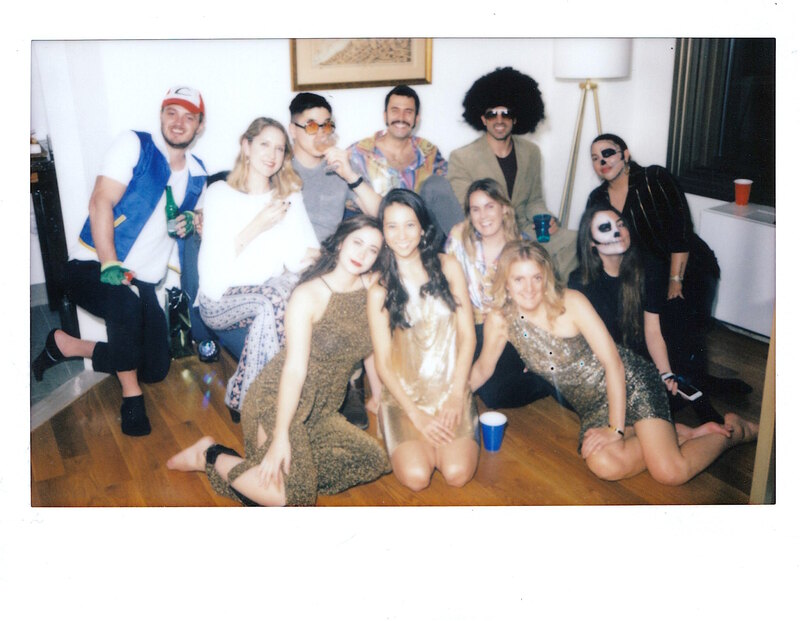 Midtown Manhattan resident Alex (center) with friends during her Saturday Night Fever costume house party, 10/27/18 at 8pm. 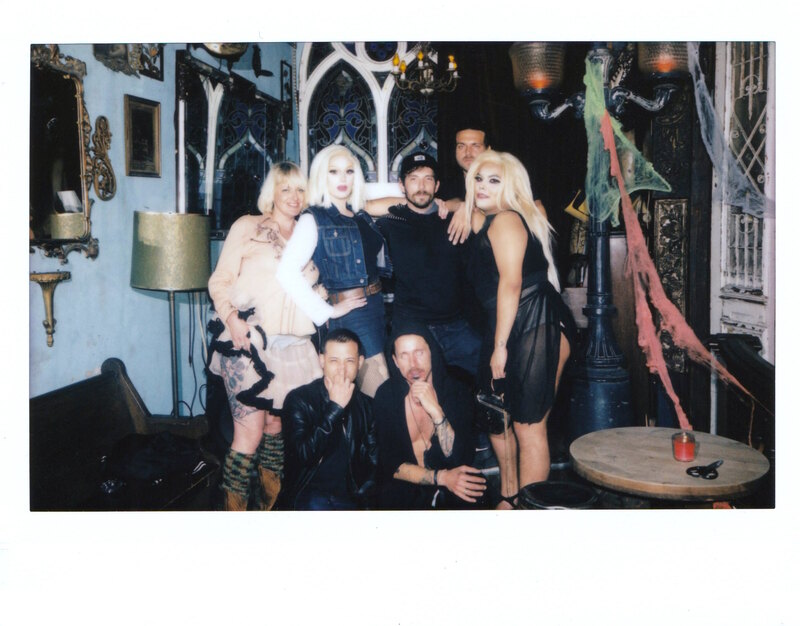 Bitchfest: Halloween/Neboutos Edition performer Gene Baker and co-host Lavender Malin (second and third from left) in Bushwick, 10/27/18 at 9:30pm. 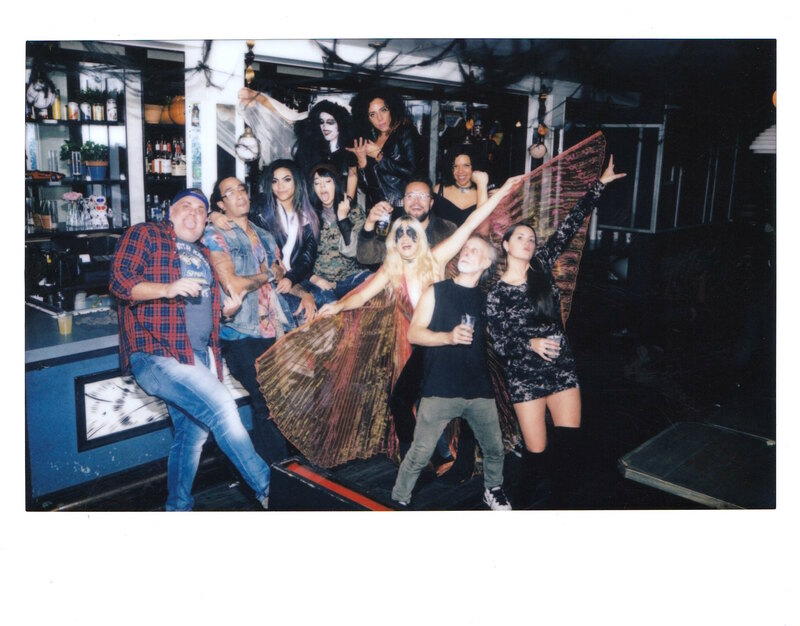 Secret Mansion’s Haunted Mansion party in South Brooklyn with hosts Alex Neuhausen and Robin French (on stage, (top left and right), 10/28/18 at 12am. 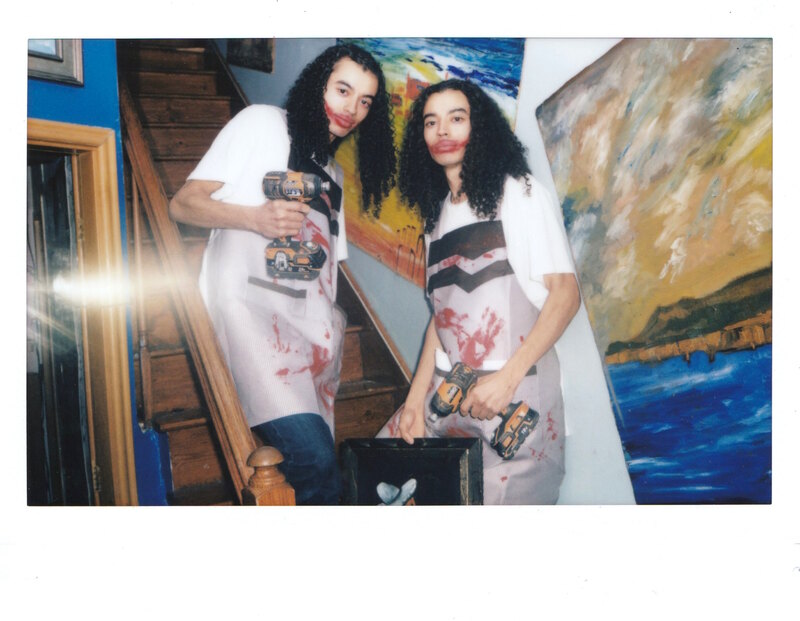 Secret Mansion doormen Tevin and Taylor Baily dressed as the Taco Truck Killers. 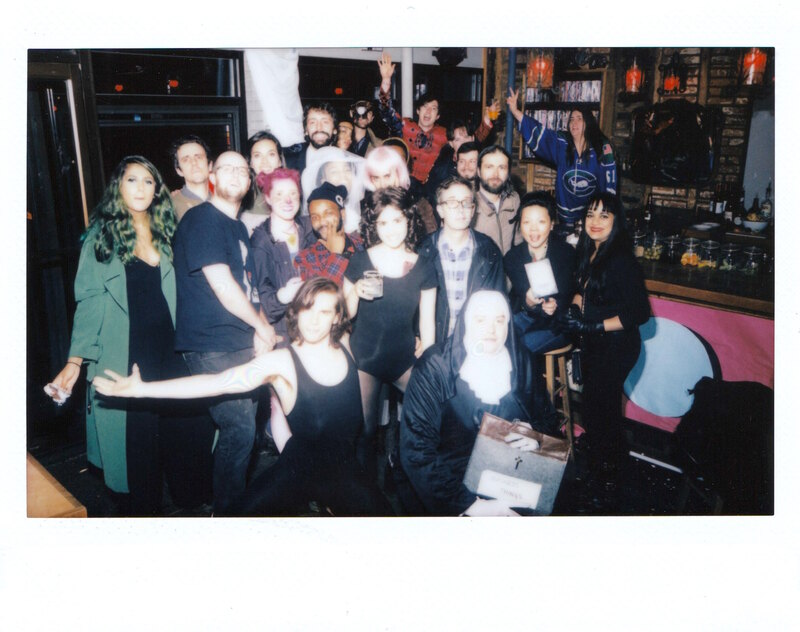 Videology’s staff and patrons at the finale of their Suspiria Halloween Costume party for the venue’s closing night, 10/28/18 at 2am. 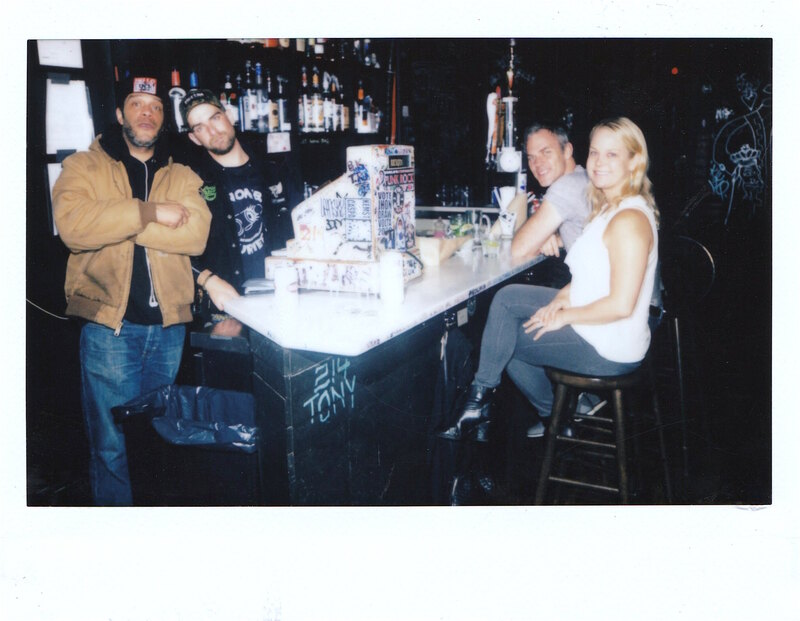 Videology co-owner James Leet (left) with his former and present staff on his venue’s closing night, 10/28/18 at 2am. 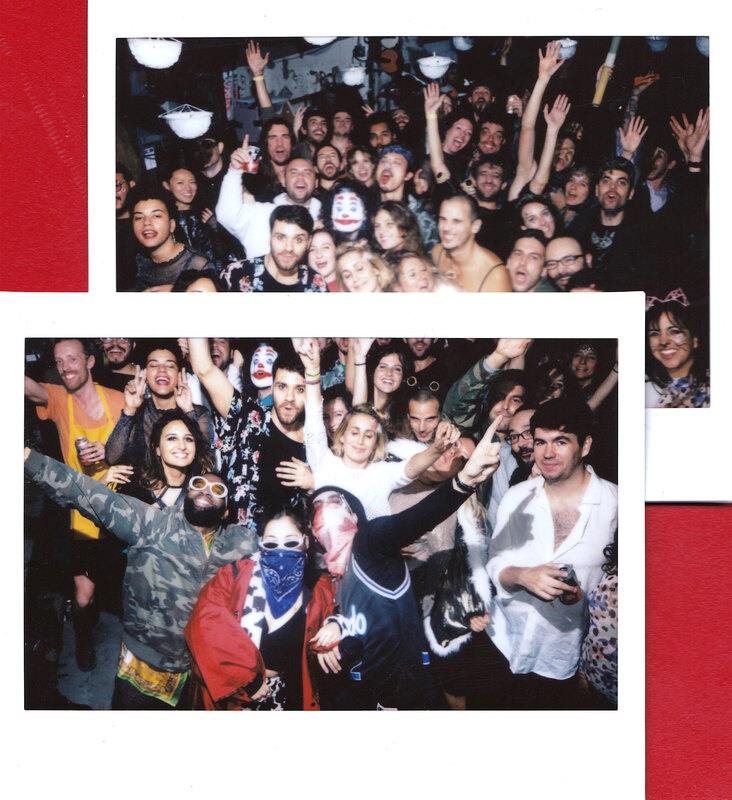 DJ Dirtyfinger (top, center) with fans during his set Bike Kill XV’x afterparty in East Williamsburg, 10/28/18 at 3am. 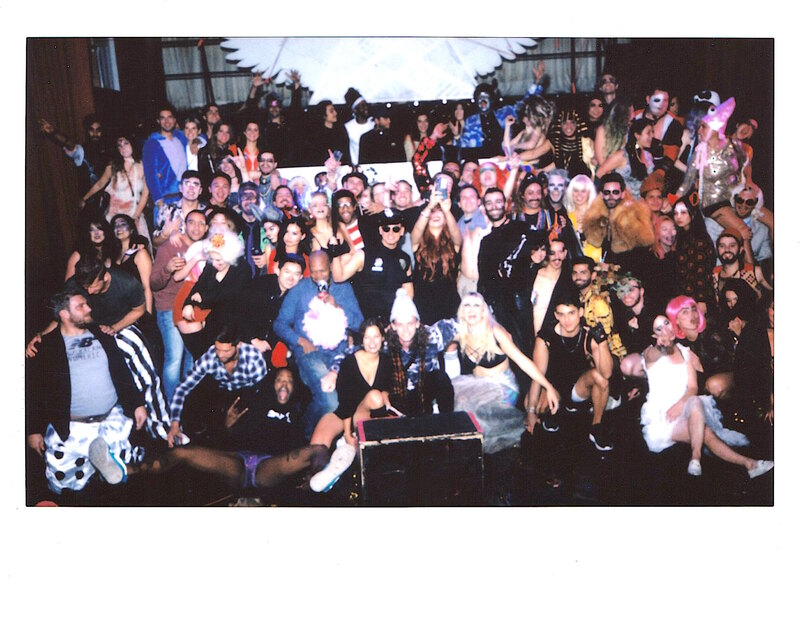 DJ Eli Escobar with fans at the finale of House of Yes’ House of Hallucinations Halloween party, 10/28/18 at 4:30am. 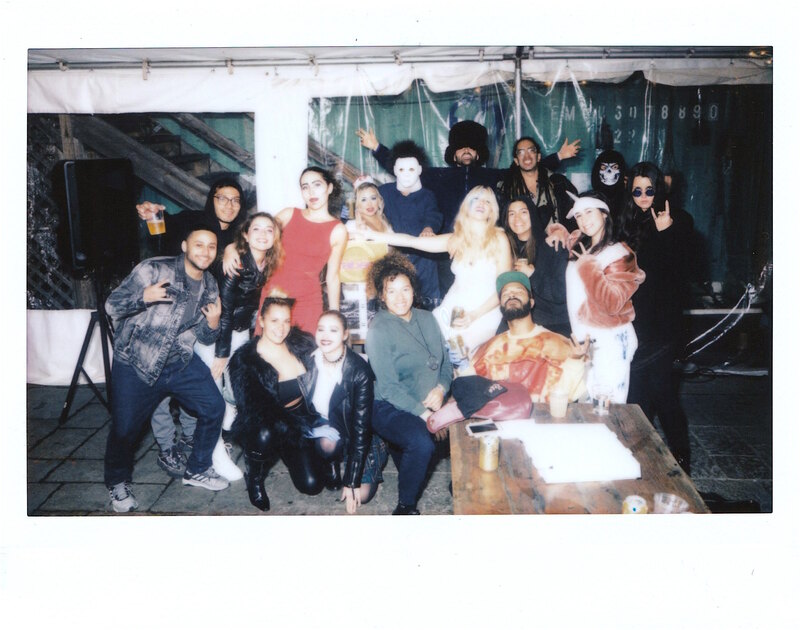 Bob and Shirley’s Brain Forest Halloween party in Ridgewood featuring hosts Ashley Benzwie and Fernelly Sarria (center), 10/28/18 at 5am. 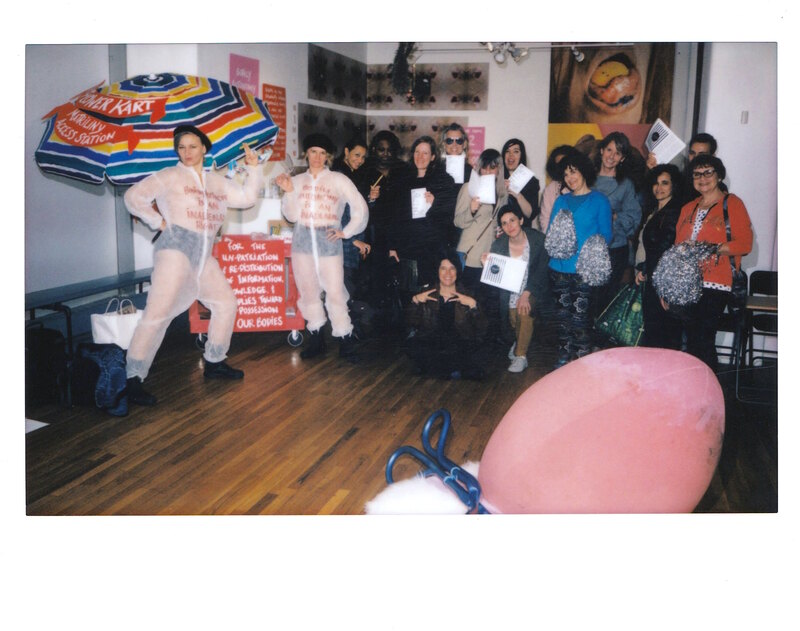 Party after their dawn finale in Bushwick, 10/28/18 at 8am. 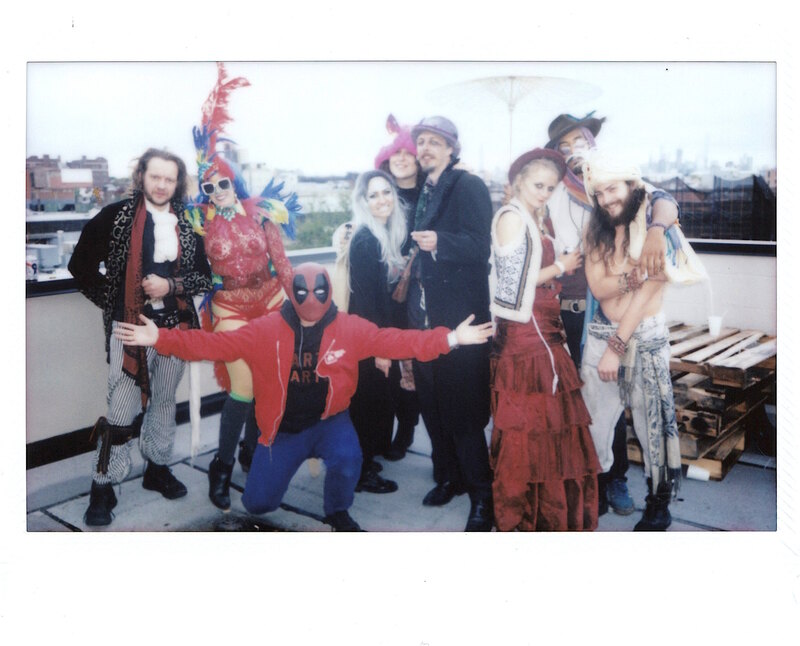 Morning partiers atop the Nightmare on Morgan Ave Halloween party in Bushwick, 10/28/18 at 9am. 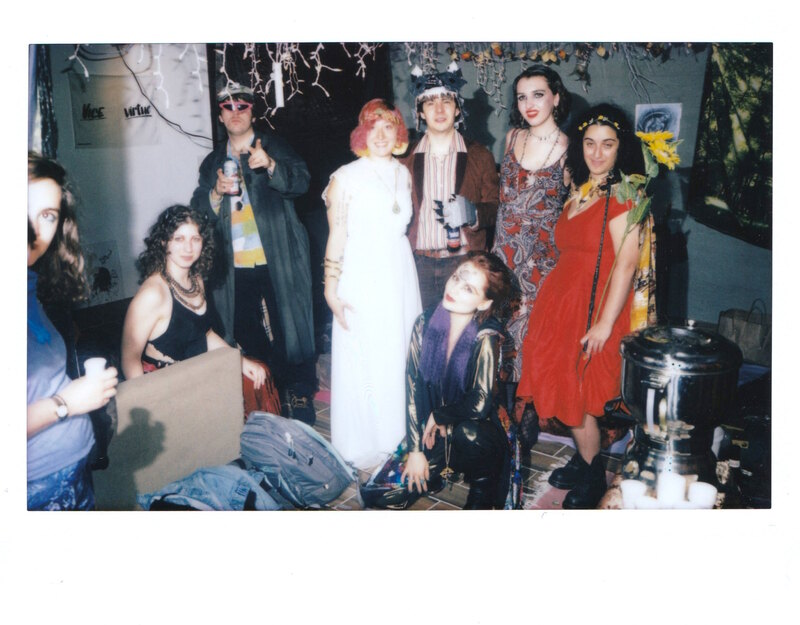 DJ’s Alanna Raben and Big Vic (center, l & r) during tHeir Grunch brunch costume party at Roberta’s Pizza in Bushwick, 10/28/18 at 6pm. 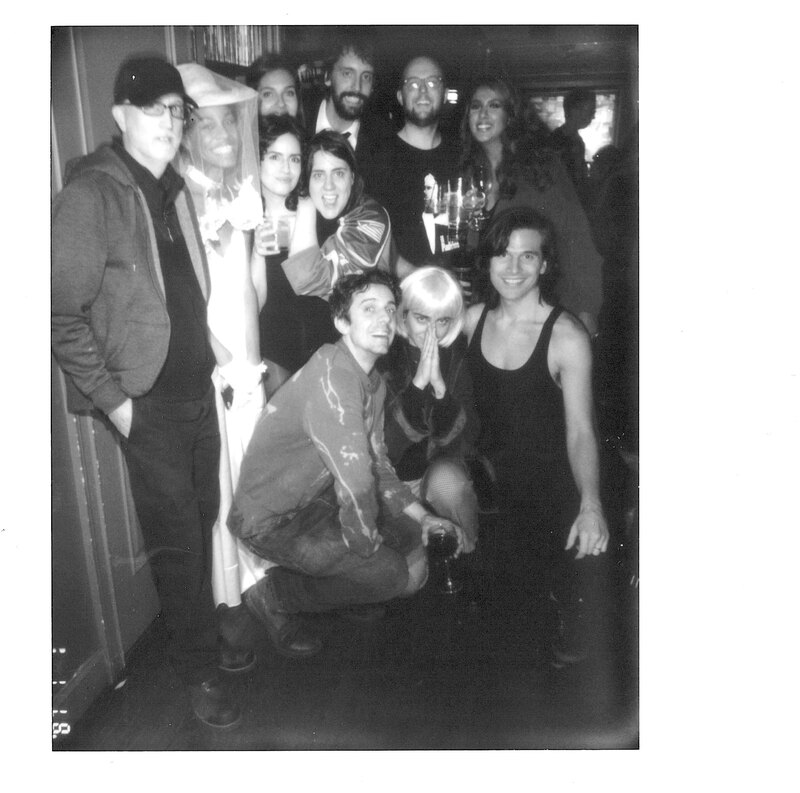 G House NYC’s DJ Mike Trotter (center) with performers Lady Havokk and Hannah Lou (first and third from right) at the finale of his Dead Man’s Brunch at The Keep in Ridgewood, 10/28/18 at 8pm.